The Craftsman 205cc 24inch Dual Stage Snowblower has a large 24 inch clearing width with 10 inch steel augers with saw tooth teeth to break down the hardest snow. the 9 inch impeller combined with the 205 cc engine made by Briggs and Stratton completes this powerful combination generating 9 foot pounds of torque. This snow blower is ideal for most consumers who just need to clear their driveways of snow and get on the road first thing in the morning. It is large enough to make quick work of most snow conditions, yet small enough to fit in the garage along side the car. The combination of saw tooth auger and impeller makes this dual stage snow blower an affordable powerful machine. Although it does not have some of the features that large more expensive machines have, it is price economically and is affordable for many urban consumers. Transmission: Dual stage operation is designed for quick, easy removal of large amount of snow. Dual stage operation is designed for quick, easy removal of large amount of snow. The steel rotation chute can be hand cranked in a full 180 degree direction to allow you to blow snow in just about any direction. The Craftsman 205cc 24inch Dual Stage Snowblower also comes with an electric starter which makes starting this engine easy on cold days. There is also a backup pull chord to start the engine. It also comes with a 2 year warranty. Craftsman has one of the best reputations in the business. Sears has started allowing customer feedback on its site and so far this machine has one very positive review with a 4 out of 5 rating. Although it is a bit difficult, operators can hold both engagement controls in place for forward motion and snow throwing with one hand and rotate the chute by cranking the chute around at the same time. Delivery: Delivery of the Craftsman 205cc 24inch Dual Stage Snowblower can be arranged through the dealer that you purchase the machine from. There will be a delivery charge, however this is probably the most economical method unless you have access to a van or a small trailer that you can transport the snow blower on. Accessories: Most snow blowers can add a wind shield or snow shield to them to protect you from three sides from the wind and snow. If you live in a climate with lots of wind and blowing snow this accessory is defiantly something to consider. 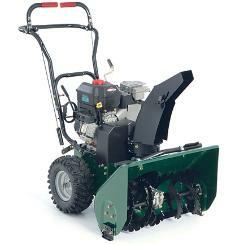 Online Reviews: We were unable to find any online reviews for the Craftsman 205cc 24inch Dual Stage Snowblower, however please leave your comments at the end of this blog if you have used one of these machines. This craftsman snow blower is a powerful machine and should be treated with safety in mind. Carefully read all of the safety guidelines in the manual prior to operating the machine for the first time. Follow these guidelines to ensure that both you and the machine do not have an accident. Prior to starting the Craftsman 205cc 24inch Dual Stage Snowblower. Perform a quick walk around check of the machine to ensure there are no loose parts and no leaking fluids. Check the engine oil to ensure that it is at the correct level as specified by the manual. Top up if necessary. Fill the fuel tank while the engine is cold and prior to using the machine. If you do spill fuel, wait until it has fully evaporated prior to starting the engine. Never spill fuel on a hot engine to avoid fires and always fill the fuel tank outdoors to avoid any possibility of vapors going into your house. Finally never point the chute in the direction of people, buildings or cars to avoid any possible damage and accidents. Sometimes chunks of ice can be thrown at high speed from the chute. If they hit something, it can cause a lot of damage. Like all snow blowers or snow throwers, maintenance is important for your machine to operate at a peak level. Change the engine oil regularly, check the belts for tightness, and change the spark plug as required. Grease any spots outlined in the manual. If you need to leave the snow blower outside all year round, cover the machine with a proper cover. Keep it looking new and avoid deterioration of the tires and metal components. For more information about other Craftsman snow blower models, click here.